This brownie recipe is not only a delicious Christmas bake, but also the perfect way of using half a jar of sweet mincemeat. It’s delicious and indulgent as you would expect with a brownie recipe that includes real chocolate in the mixture. Chocolate Brownies. They’re fudgey. They’re rich. They’re chocolatey. They’re indulgent! I ask you, what’s not to like?! Brownies are not only incredibly quick and easy to make, but they lend themselves nicely to having a few ‘extras’ added to the mixture. Often this popular chocolate tray bake recipe include nuts of some sort – walnuts, almonds, macadamia for instance. But have you ever tried it with mincemeat? Sweet mincemeat that is, the sort which flies off the supermarket shelves at this time of year for those essential mince pies! If you’re looking for other ways to use up your left over mincemeat I can whole heartedly recommend adding it to a brownie mix. Not only are brownies super easy to make, but I’m sure I’m right in saying that everybody loves a brownie! 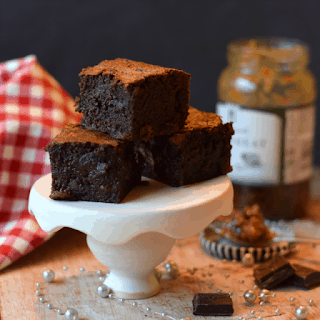 This brownie recipe is not only the perfect bake to enjoy in the build up to the festivities, but also well into the New Year too when you stumble across that half empty jar of sweet mincemeat at the back of the fridge. Even though the jar has no doubt been open for a few weeks, it’ll be just fine added to a chocolate brownie batter. Not only does the fruit add extra interest to the chocolatey treat, but it also brings extra moisture too! Yum! Strange as it may sound to some, I personally find brownies a little too rich when made with dark chocolate. So, in this recipe I’ve used a 50/50 mix of dark and milk. Of course if you prefer a more indulgent and richer note from your chocolate simply substitute the milk chocolate for more of the dark stuff, or replace some of the flour with the same quantity of cocoa powder (though you may need to up the quantity of sugar a little). If you’re not familiar with mincemeat, or sweet mincemeat as I prefer to call it, it’s a mixture of dried fruits, peel, spices and often alcohol. It’s popular here in the UK during the Christmas period. Although the fruity mixture included large quantities of meat – such as beef, venison and suet – back in the 15th and 16th centuries, and therefore explains the name, over the years the recipe for it has developed and the meat element has reduced until it is no longer included. Many of the jars of mincemeat available in the shops these days are suitable for vegetarians, though do double check when catering for vegetarians and vegans as some recipes do still use a meat suet. If you’re unable to source sweet mincemeat from your local supermarket, here are a few mincemeat recipes which can be made at home. This Chocolate Mincemeat from Helen at The Crazy Kitchen is a twist on the traditional homemade mincemeat, with added dark chocolate. Recipes Made Easy shares a recipe for Homemade Mincemeat which interestingly includes grated carrot alongside the usual dried fruit and spices, which I suspect brings extra sweetness and moisture. I think the name of Foodie Quine’s Boozy Gin Mincemeat says it all! So here’s how to make Christmas Brownies with Mincemeat. real chocolate in the mixture. a) It’s key to avoid over baking the brownie. Removing it too soon will result in it being too soft, though over baking it will create something more cake like. When ready it will no longer wobble in the centre, though an inserted skewer will still hold some moist crumbs. Ours took 45 minutes to bake. b) Store in an airtight container. c) Allow the brownies to come back to room temperature before enjoying any slices which may have been chilled. d) Brownies are best eaten the day after baking. e) If you enjoy richer brownies either substitute the milk chocolate for more plain chocolate. Alternatively reduce the flour content by 10g and increase the cocoa quantity by 10g. Be aware that you you may need to increase the sugar quantity a little. oh my goodness they are so gooey & gorgeous looking! My kids would have those polished off in no time! what a fab bake that uses the mincemeat up without feeling too christmassy. Thanks for linking to my chocolate mincemeat too. Aw thankyou Helen 🙂 Hubby took sme pieces of it into work for his colleagues and let's just say the box was soon empty! Oh I bet these are good Angela. I'm very partial to a brownie and would love to try one. 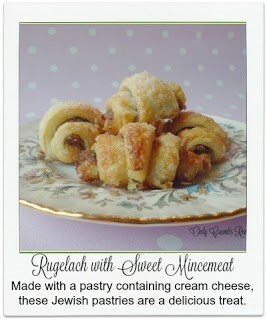 What a fab idea to add mincemeat. I've already taken your raspberry fudge recipe for We Should Cocoa and as it's only one entry per month, I can't really include this one too. Sorry. Thank you Jenny 🙂 They were very yummy, and satisfying to know that it made good use of some mincemeat I had lurking in the fridge. I never thought of adding mincemeat to brownies, what a great idea! Thank you for linking up to Treat Petite. what a great twist to add mincemeat to chocolate brownies! We've tried mincemeat shortbread before but never would have thought to add to chocolate brownies! I've only recently discovered that chocolate and mincemeat go perfectly together, I can't believe it took me so long to realise. These brownies sound absolutely delicious. It really is a lovely combination isn't it, it's something that I've only recently tried too.